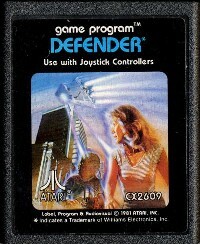 When I speak of the great arcade games, Defender is in the top five, every time. 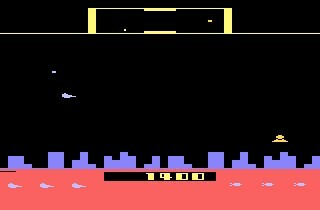 Defender for the 2600 was a reasonable adaptation of the arcade game for home, but due to the limitations of the hardware, the lack of maturity in software (they hadn't developed all of the tricks yet), and the small ROM size (4k), Defender was not a good translation of its arcade brother. 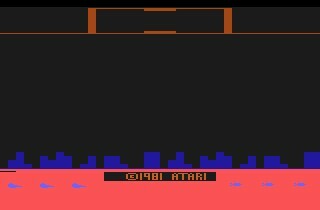 Three years later, with twice as much memory, and 3 years of tricks learned, Atari released Stargate, which has become a favorite of mine. 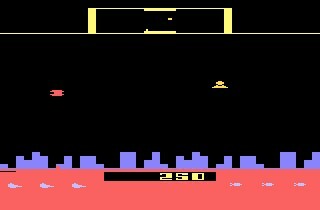 I'd say that Defender suffered a little from Pac-Man syndrome - its sequel out did it in every way, and matched the arcade extremely well (a slap in the face to those crying of the 2600's limitations). But the developer here loved the game, and the limitations in the translation of gameplay lay more with memory limitations and the maturity of the system than anything else. Defender is actually fun to play, and a veritable classic in every way. It has even been enshrined in stamp form as the representative of Video Games for the 80's stamp collection (which I proudly own). Let's get to some gameplay! Like the arcade, you fly your fighter over a planet - a city in this version. The enemies don't look much like their arcade counterparts, but are recognizable. You can actually fly through enemies if you time your firing right, but it can be disorienting otherwise. 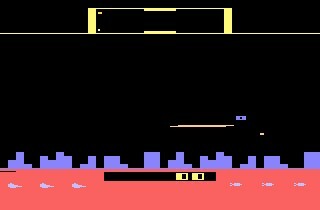 Hyperspace - fly to the top of the screen so that your ship disappears behind the scanner, then press the fire button. You cannot die when emerging from hyperspace like you can in Stargate or the arcade games. 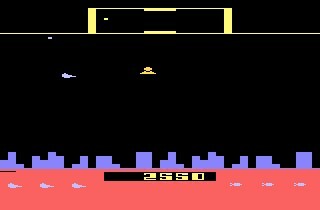 Smart bombs - fly down to the city and press fire. Everything on the screen will be eliminated. It's amazing that programmers were able to get past the one button limitation in so many different ways, isn't it? Another limitation of this version is that only one lander can abduct a humanoid at a time. 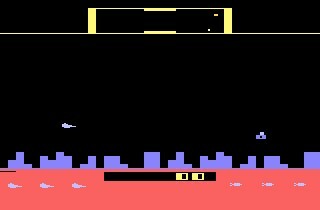 Half the fun of Defender is that it was hard. I remember marathon sessions with friends going all night, where we'd switch off every hour or so to keep our hands from cramping. 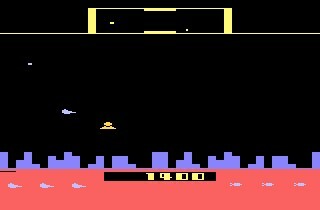 I played Defender a lot when I was a kid - I never had Stargate back then. I play rarely now, as Stargate captures the feel of both games far better. It's a classic, and helped really launch the system in 1981, but it could be far better, as Stargate proved. Defender is not to be missed, but if you like Defender, you'll love Stargate. You can get the ROM and 2600 Emulators at the Classic Gaming Game Vault.